Belleville’s Memorial Arena has been a significant community centre for over 80 years and continues to be instrumental in the development of hockey careers. 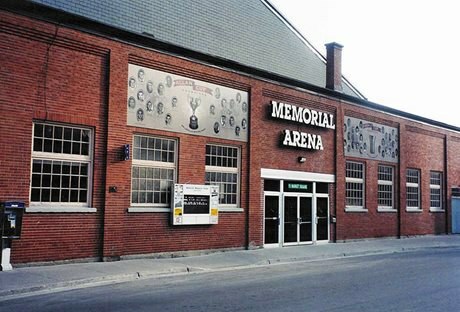 Originally called Hume Arena, it was purchased by the City of Belleville in 1946 and renamed the Belleville Memorial Arena to honour war veterans. Constructed as a smaller version of Toronto’s Maple Leaf Gardens, its unique squared corners made playing hockey different than at other rinks. Many great hockey players have skated on its ice, including Bobby Hull, Matte Cooke, Brad Richardson and Andrew Shaw. From 1956-61, it was home ice for the Belleville McFarlands, the team that defeated the Soviet Union in 1959 to win the World Championship. The arena was also home to the Quinte Figure Skating Club. It was designated under the Ontario Heritage Act in 2003 by the City of Belleville and remains a time capsule of sports history. Learn more about the Belleville Memorial Arena by visiting its website. Learn more about this City of Belleville heritage-designated building.